Parkinsonism and dementia are present in a number of neurodegenerative conditions. They may be a manifestation of isolated brain stem (Parkinson’s disease) or diffuse Lewy body disease (DLBD), or be secondary to combined Lewy body and Alzheimer’s disease (AD) pathologies. Positron emission tomography (PET) studies show a resting pattern of fronto-temporo-parietal hypometabolism in both, AD and in parkinsonism-dementia (PD-dementia) patients, even when only isolated brain stem Lewy body disease is found at pathology. We have studied three patients fulfilling clinical criteria for diagnosis of DLBD. Their 18F-fluorodeoxyglucose (FDG) PET results showed an AD pattern of fronto-temporo-parietal hypometabolism, though these patients had only mild cognitive dysfunction. 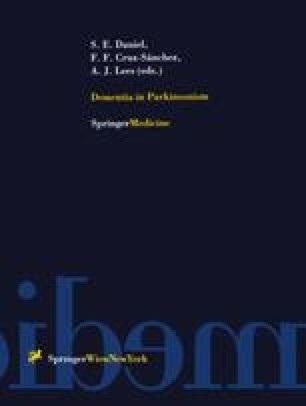 Parkinsonism associated with apraxia is observed in corticobasal degeneration (CBD) while impairment of frontal functions, such as planning and sorting, is seen in patients with progressive supranuclear palsy (PSP). PET studies in CBD patients have shown an asymmetric hypometabolism of cortex and thalamus contralateral to the affected limbs, while in PSP patients there is a global metabolic reduction most pronounced in frontal areas and the basal ganglia. These results suggest that metabolic PET studies can help to distinguish PD-dementia, PSP and CBD, but are unable to distinguish PD-dementia from AD. Further studies with post-mortem confirmation are required to establish if DLBD is associated with a distinctive pattern of resting hypometabolism.